Tirujnanasambandar Thevaram Vaane malaiye yena mannuyire Thane thozhuvaar thozhudaal maniye Aane sivane yazhundai yavarem Mane yenamaa mada manninaiye. 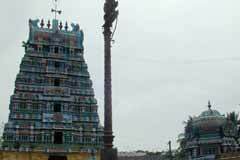 This is the 38th holy place in the southern banks of Kaveri consecrated by Thevaram. Flag is hoisted 10 days before Chitra Pournami day and ends with Car festival. On the 23rd, 24th and 25th days of Maasi month from 5.55 pm to 6.05 pm ‘Sooriya Pooja’ (Sun Worship) is performed. This is a Siva temple facing west. This is the birth-place of the poet Kavichakravarthi Kambar. The temple is open from 6.00 am to 11.30 am and from 5.00pm to 8.30 pm. 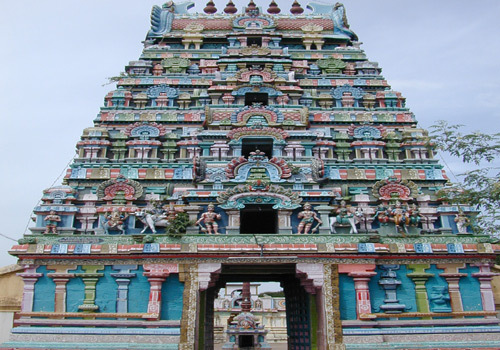 Arulmigu Vedapureeswarar Tirukkoil, Therazhundur Post – 609 808; Mayiladuthurai Taluk, Nagapattinam District. 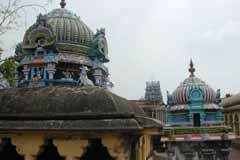 As a child when Tirujnanasambandar came to this place, two temples were seen high on two sides and there arose a doubt in him which of these was the Siva temple. 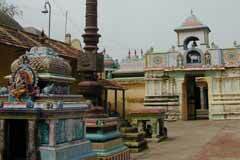 At that time, Lord Vinayaka of this place pointed to a temple, “that is the temple of Easwara”. Hence, this Vinayaka is known as “Jnanasambanda Vinayakar”. 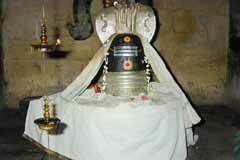 Sage Agastya has worshipped the Lord of this place. Those, who desire their beauty should be appreciated by others, pray to Ambal. When their prayer is granted, they perform abhishekam for Swami and Ambal, and offer new clothes. Sage Agastya was worshipping the Lord of this place. King Urthuvaradan, without knowing this, was driving his car along the sky-space. The car paused and did not move. Hence, this holy place came to be known as ‘Therazhundur’. 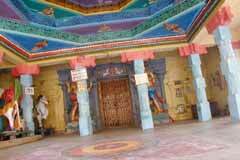 The Lord of this sacred place, was worshipped by the Vedas, Devas, Ashtadik Balakas and sages. 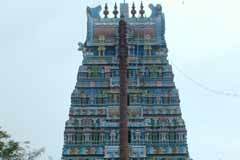 The mandapam where Lord Siva and Vishnu played dice game is still there. 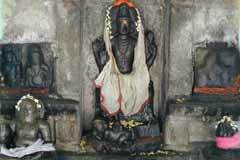 During the period when Siva and Shakti were separated, Indra and other Devas came here to meet them. But, Nandi did not allow them to meet Lord Siva. So the Ashtadik Balakas installed Lingam around the city and worshipped. The Lingas are still seen here. Kaveri and Sage Agastya were relieved of their curses here. So they have separate Sanctum. Once Parameswara and Mahavishnu played Dice game with Parvati as the umpire. At one phase, there arose a doubt regarding the number of the dice. 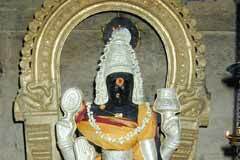 The umpire Parvati supporting Perumal found fault with Siva. The infuriated Siva cursed Parvati to become a cow. Lord Vishnu felt that because of him only Parvati became a cow and so incarnated as a cowherd in this place. 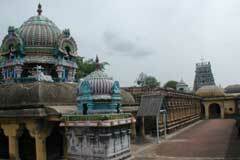 So, the name of the Perumal of this sacred place became ‘Aamaruviappan’. Parvati who became a cow went to several sacred places, prayed and finally came to this holy place, worshipped Lord Siva and got back her beautiful figure. She was called ‘Soundaryanayaki’. Those who want their beauty to be liked by others can receive Grace from this Ambal. Lord Siva regretted for having cursed Parvati as a cow, came here and taught Veda to the priests -- hence the holy name of the Lord, ‘Vedapureeswarar’. Miracle Based: On the 23rd, 24th and 25th days of Maasi month from 5.55 pm to 6.05 pm ‘Sooriya Pooja’ (Sun Worship) is performed. This is a Siva temple facing west. This is the birth-place of the poet Kavichakravarthi Kambar.